In her book, Inside of A Dog, author and researcher Alexandra Horowitz writes, “We are known by our dogs— probably far better than we know them.” Horowitz is right, and sadly dogs don’t come with a user’s manual. In my 19 years of teaching dog training classes, I have tried to teach my students about more than training; if you want to be a good companion to your dog, you need to know about your dog’s language, natural history, anatomy, emotions, and everything else that makes your dog a dog. I believe one of the best gifts we can give to ourselves and to our dogs is a better understanding of who they are. In my columns for November and December, I’ll review the books that everyone who lives with a dog should read. It’s a perfect time to pick one up for yourself or for another dog lover in your family or circle of friends. On Talking Terms with Dogs: Calming Signals by Turid Rugaas – This book and its author, Turid Rugaas, have influenced my understanding of dogs more than any other book or seminar. While this book is few in pages, it is rich in information depicted in great photos. This gentle, kind, woman is incredibly knowledgeable about canine behavior and ethology. She has taught many how to live in harmony with our dogs by helping us to better understand what they are trying to tell us, and in turn she has taught us a better way to express ourselves to our dogs. Full of photographs illustrating each point, On Talking Terms with Dogs: Calming Signals focuses on how dogs use specific body language to cutoff aggression and other perceived threats. Dogs use these calming signals to tell one another, and us, when they are feeling anxious and stressed and when their intentions are benign. If you have more than one dog, or if your dog frequently plays with others, or if you are a frequent visitor to the dog park, you need to be familiar with calming signals. This book will help you learn ‘dog language’, for which you will be rewarded with a much better understanding of your pet and its behavior. 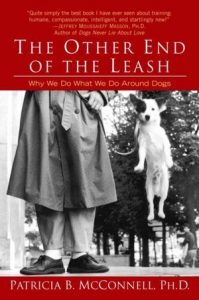 The Other End of the Leash – by Patricia McConnell, PhD – Back in the early 1990’s, before I entered into the pet care business, I was fortunate to attend several dog training classes taught by Dr. Patricia McConnell. Her understanding of how dogs and humans communicate and her emphasis on rewarding good behavior made this the first class my dog Gus and I really enjoyed. The Other End of the Leash is an information-packed, yet readable book. In it you will learn how to have an improved relationship with your dog through better communication. As a scientist who has studied both primate and canine communication systems, Dr. McConnell has a keen understanding of where the communication between humans and dogs often breaks down, creating frustration and stress for both species. For example, she explains how simple innate greeting patterns of both species can cause conflict. We know that when two people meet, the polite thing to do is to make direct eye contact and walk straight toward one another smiling. However, as Dr. McConnell notes: “The oh-so-polite primate approach is appallingly rude in canine society. You might as well urinate on a dog’s head.” Direct eye contact and a direct approach is very confrontational to a dog. Dr. McConnell also emphasizes how dogs primarily communicate visually, while humans are a very verbal species. The picture she paints of the frustrated chimp, jumping up and down, waving their hands, and screeching repeatedly is only a slight exaggeration of the frustrated human, saying “sit, sit, sit, ahhhh please sit” while displaying countless bits of body language. Primates, including humans, “…have a tendency to repeat notes when we’re excited, to use loud noises to impress others, and to thrash around whatever is in our paw if we’re frustrated. This behavior has no small effect on our interactions with dogs, who in spite of some barks and growls, mostly communicate visually, get quiet rather than noisy to impress others, and are too busy standing on their paws to do much else with them.” With these fundamental differences, it’s amazing we can communicate with our dogs at all. DOGS: A Startling New Understanding of Canine Origin, Behavior and Evolution by Raymond and Lorna Coppinger – This book refutes a great number of the popular myths about the domestic dog with sound science. Dr. Coppinger is a professor at Hampshire College where he teaches evolutionary biology. He and his wife Lorna have over 40 years of experience living and working with all varieties of dogs. The main premise of this book is that humans did not create the dog by taming and domesticating the wolf, but instead the dog self-evolved from the wolf. Tamer and less energetic wolves started hanging around human settlements for the discarded food and over time these wolves evolved into today’s village dog. Only in the last few hundred years have humans become involved in consciously, and not always responsibly, engineering the village dog into the many breeds we see today. The Coppinger’s have studied village dogs (feral dogs living in human communities) as they exist in the world today in places like Mexico City, and Pemba. SUGGESTED AUDIENCE: Dog lovers who want to improve the relationship with their dog by understanding how dogs and primates can better communicate with one another. Back in the early 1990’s, when we still lived in Wisconsin, and before we got into the pet care business, Paula and I attended several dog training classes with our dogs, Gus and Shed. It was not until 1994 that we found Dr. Patricia McConnell and her training school, Dog’s Best Friend. This dog training class was the first that all of us, humans and dogs alike, truly enjoyed. Why? Because of Dr. McConnell’s understanding of how dogs and humans communicate and her emphasis on rewarding good behavior. Now the world can benefit from her knowledge in her new book, The Other End Of The Leash. The Other End Of The Leash is an information-packed, yet readable book. In it, you will learn how to have an improved relationship with your dog through better communication. As a scientist who has studied both primate and canine communication systems, Dr. McConnell has a keen understanding of where the communication between humans and dogs often breaks down, creating frustration and stress for both species. For example, she explains how simple innate greeting patterns of both species can cause conflict. We know that when two people meet, the polite thing to do is to make direct eye contact and walk straight toward one another smiling. However, as Dr. McConnell notes: “The oh-so-polite primate approach is appallingly rude in canine society. You might as well urinate on a dog’s head.” The fact is direct eye contact, and a direct approach is very confrontational to a dog. Dr. McConnell also emphasizes how dogs primarily communicate visually, while humans are a very verbal species. The picture she paints of the frustrated chimp, jumping up and down, waving their hands, and screeching repeatedly is only a slight exaggeration of the frustrated human, saying “sit, sit, sit, ahhhh please sit” while displaying countless bits of body language. Primates, including humans, “…have a tendency to repeat notes when we are excited, to use loud noises to impress others, and to thrash around whatever is in our paw if we are frustrated. This behavior has no small effect on our interactions with dogs, who in spite of some barks and growls, mostly communicate visually, get quiet rather than noisy to impress others, and are too busy standing on their paws to do much else with them.” With these fundamental differences, it is amazing we can communicate with our dogs at all. While Trisha’s book will certainly enlighten you, it will also move you. Her description of her relationships with her own animals leaves no doubt about her love and commitment. Reading her recollection of how her beloved Luke was almost hit by a car and the passing of her little Border Collie Misty had me very near tears. I highly recommend The Other End Of The Leash for anyone with a dog in their life.